Having helped many organizations implement Managed Output Strategies (MOS) we have developed a streamlined process to achieve maximum benefits in the shortest amount of time. Successful projects begin with a vision for the destination. The first step is to set objectives for the MOS. It is important that the strategy align with the overall business strategy. One company may have a corporate initiative to reduce overhead expenses by x% while another company may be focused on rolling out a consistent professional image. MOS could serve both of these needs, however, the implementation would be different. Now that all of the devices are discovered, the next question is where are the devices located? This is accomplished by a quick walk through of your facilities. During the walk through, each system can be mapped to your floor plan. A quick inspection of each device also determines the condition of the system. How do people use the devices? This is a critical step. 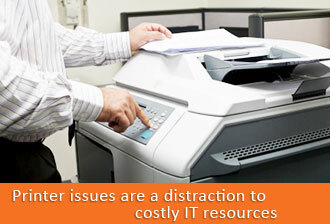 You would not want to end up hurting productivity as a side result of cutting costs. Similarly, if there were ways that productivity could be increased, you would want to know too. We learn this by interviewing key end users. The last step is to take a second usage measurement. This allows us to see the actual usage of the devices over a period of time such as two weeks or a month. This information can be formatted to determine average monthly usage counts for each device. With all of the above information in hand, we work to determine the Total Cost of Ownership (TCO) of your document output. This can be done by multiplying your usage by industry average supply costs from big box office supply stores. Or, we can create a more accurate TCO measurement by using your actual invoices. The end result is a TCO consensus that we mutually agree on. Similarly, we work together to develop consensus on the most important end user and device issues. This forms the baseline for future improvements. With the final destination in mind from step one and the current situation understood from step 2, the next job is to develop a path for improvement. Next, we create recommended actions to improve your output fleet and reduce costs. While it would be nice to immediately realize all of the benefits of a MOS, the reality is that most environments want to phase in the benefits over a period of time. Top priorities can be implemented first. Then, additional items can be rolled out as appropriate. Needs evolve. Many companies choose to set up an quarterly or semi-annual meeting with their output provider to review progress and roll out additional phases of the MOS. Reports from the print monitoring software can be used to identify usage trends, spotlight problem devices and measure program effectiveness. Contact us today to learn more about how One Print Solutions can help you get started. Manage your printing needs while reducing your printing costs. Think outside the box and reduce costs with innovative strategies from One Print Solutions. We do more than just provide printer supplies and nationwide printer service. You can take advantage of our comprehensive programs to measure, manage and reduce your printing costs.